Famed for its white sand beaches and luxury resorts, the Maldives under President Yameen Abdul Gayoom, who is seeking re-election, has seen economic growth and longer life expectancy, according to the World Bank. But Yameen’s critics say he has systematically rolled back democratic freedoms, jailing rivals and controlling courts. Like elsewhere in South Asia, China has made fast inroads into the Maldives with aid and investment, challenging India’s long-held position as the dominant regional power. The Maldives is a low-lying archipelago in South Asia formed from a chain of about 1,200 coral islands grouped in 26 atolls in the Indian Ocean, 430 kilometers (265 miles) southwest of India. The reefs, less than a meter (3.2 feet) above the sea, attract scuba divers from around the world, but they’re also threatened by rising temperatures and sea levels. Former President Mohamed Nasheed held an underwater Cabinet meeting in 2009 to highlight the threat of climate change. The Maldives was a British protectorate until 1965. The centuries-old sultanate was restored again a year later until 1968. Maumoon Abdul Gayoom came to power in 1978 through a public referendum, ruling with an iron fist until 2008. That year, Mohamed Nasheed became the country’s first freely elected president. But Nasheed was forced to resign and later was sentenced to a 13-year prison term. He was later granted asylum in the United Kingdom when he traveled there for medical treatment, and continues to live in exile. Nasheed was succeeded by his running mate, Mohamed Waheed Hasan. Current President Yameen, Gayoom’s half brother, won in 2013. His former vice president, Ahmed Adeeb, Gayoom, two ex-defense ministers, a prosecutor general and opposition lawmakers are among those who have been jailed during Yameen’s five-year tenure. All of the trials have been criticized for alleged lack of fairness. With Nasheed ineligible to run in Sunday’s election because of his conviction, the opposition joined forces around longtime lawmaker Ibrahim Mohamed Solih, Yameen’s only contender. 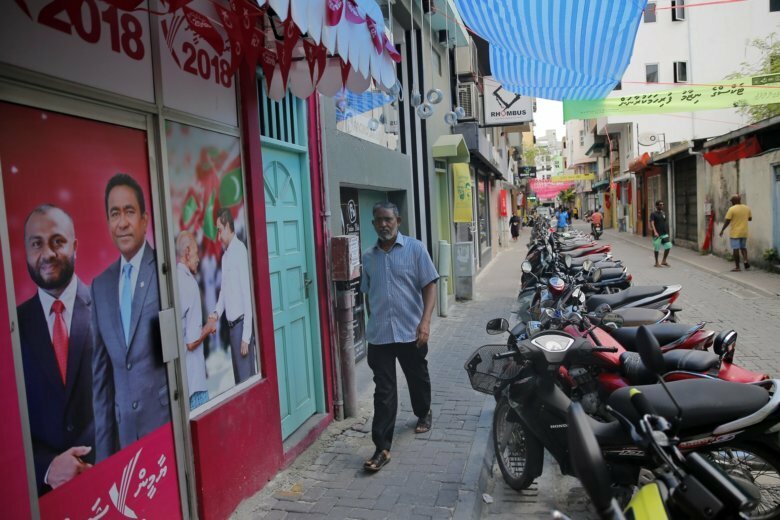 The opposition and outside observers have cautioned that because of Yameen’s tight control of government institutions, Sunday’s election could be rigged. The European Union canceled plans to send observers after determining that the Maldives had not met the conditions for monitoring. The U.S. has threatened to sanction Maldivian officials if the elections are not free and fair. Nasheed told reporters in neighboring Sri Lanka on Friday that the elections are critical for stability in the Indian Ocean, where he said a “cold war was brewing” between India and China. Gulbin Sultana, a researcher on the Maldives at the Institute of Defense Studies and Analyses based in New Delhi, said that if Yameen is re-elected, the state of democracy is unlikely to improve. “That will probably mean the media, the people opposing the government will have to suffer more,” she said.